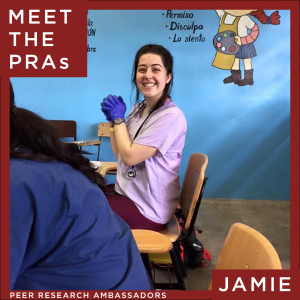 Meet Jamie Georgelos ’19 (CLAS), an OUR Peer Research Ambassador (PRA) majoring in Molecular and Cell Biology. The healthy human gut is host to a community teeming with beneficial bacteria. These help us break down food, protect us from disease, and produce some of the compounds our bodies need to function correctly. When people take too many antibiotics, they wipe out these beneficial bacteria and are more susceptible to infection. My current research is focused on identifying probiotics effective in combating bacterial infections of the gut. Once identified, I am working to determine the mechanisms the probiotics use to defend the human body, which may include secreting antimicrobial compounds, affecting the acidity of the intestines, and changing gene regulation in infective strains of bacteria. 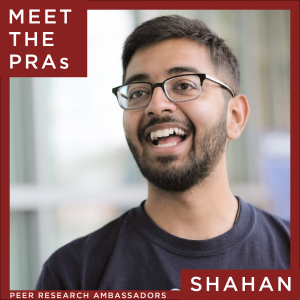 I originally got involved in research because, as a pre-med student, I thought I had to. Because I thought I was being forced into research, I took the first available position I could find. I was dispassionate about my research, and I found I was very unhappy. I left the lab, thinking the world of research wasn’t for me. When I started to learn more about microbiology in my classes, I couldn’t seem to get enough. I would stay after class to ask the professor questions, and I started to think about how certain strains of bacteria could even be used to combat issues like obesity and malnutrition. I knew the only way to keep asking questions like this was to get involved in research again. I found a lab on campus that matched my interests, and I’ve been happily asking questions ever since! Don’t forget to give yourself time to discover, and rediscover, your interests and passions. Before I settled into my microbiology work, I had a new life passion every semester! It was by figuring out what I didn’t like, both in research, classes, and even work environments, that I could find something that would keep my passions alive in the long run. Research lets me explore more than anything else has in my undergrad career. When I run into obstacles, I get to problem solve, think creatively, and come up with new solutions as part of a team. This team is full of people much more qualified and educated than I am, which gives me the opportunity to grow in a supportive environment with people who are eager to guide my research. By getting involved in research, I’ve been encouraged to leave my comfort zone. Starting with talking to professors, to developing a relationship with them, I’ve had to improve my interpersonal skills. In working with mentors, I have learned how to ask for the resources I need while still maintaining my independence. 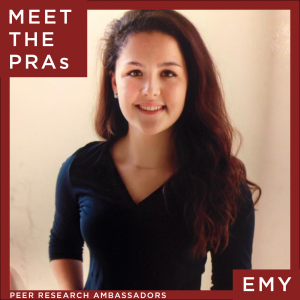 Meet Emy Regan ’19 (SFA), an OUR Peer Research Ambassador (PRA) majoring in Art – Illustration. I wrote and illustrated a comic book about a haunted Newport mansion. My goal was the create a spooky, but not scary, piece of entertainment that could be enjoyed by children and adults. I was also interested in exploring New England’s Gilded Age history through the architecture of the Newport Mansions. I got involved in creative activity because I wanted an opportunity to work independently on my projects, outside my classwork. I wanted a chance to dig deeply into an idea and my project was able to give that to me. Always be on the lookout for opportunities to pursue your research or creative goals. Opportunities are rarely delivered to your doorstep. You will have to engage in your subject area, talk to professors, and be dedicated to your goals. I enjoy the independence of working on a long-term project. It was very fulfilling to make creative decisions for myself and I gained a great deal of confidence knowing that I am capable of making these decisions. My greatest accomplishment so far is completing my IDEA Grant project. Completing my comic book was the first time I completed any independent, long-term project. I feel much more confident in my abilities after successfully writing and illustrating my project, as well as hanging and hosting an exhibit to showcase my work. 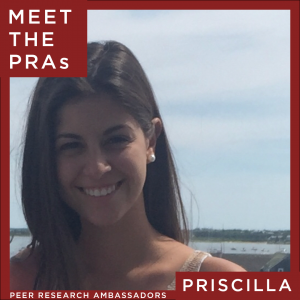 Meet Priscilla Grillakis ’19 (CLAS), an OUR Peer Research Ambassador (PRA) majoring in Speech, Language, and Hearing Sciences. I received an IDEA Grant last year to work with three students from the Neag School of Education. Our project aimed to design a peer-tutoring program to help Emergent Bilingual students improve their language abilities, and I specifically focused on the language acquisition portion. I got involved in research because I intend on becoming a Speech-Language Pathologist, and evidence-based practice is essential in this field. Through conducting my own research, I was able to learn about the research process as a whole, and I feel very capable and excited to continue researching in the future. I feel that research can offer us invaluable information, and being able to contribute something to the research in the field I am passionate about is an exciting opportunity. I would highly recommend getting involved in research from early on. Research is a very rewarding experience, and acts a way to learn more about a topic than you would in your typical scope of classes. Participating in research offered me a chance for a hands-on learning experience. I was able to explore the material I am passionate about in greater depth, and through working on an interdisciplinary team I was able to learn how to view a particular situation or problem from a variety of perspectives. What are your plans after graduation? How has involvement in research/creative activity influenced your plans and/or prepared you for the future? After graduation, I intend on attending graduate school in the hopes of becoming a Speech-Language Pathologist. My involvement in research has prepared me for my graduate school education and future career because the field values evidence-based practice, so I will need to stay updated on current research and methods. Conducting my own research has given me a new appreciation for each research paper I read, and has also inspired me to continue research in the future. Meet Natasha Patel ’19 (CLAS), an OUR Peer Research Ambassador (PRA) majoring in Molecular and Cell Biology. My research is on the use of biomaterials to treat growth plate injuries in mice. I am trying to develop a mouse injury model that represents the growth plate injuries children experience. Often during a growth plate injury what can occur is the formation of a premature bony bridge in the growth plate. This can prevent the growth plate from completing its normal function, which can stunt growth of the affected bone and lead to orthopedic problems like limb shortening and irregular growth. Studies show that blood vessels are what stimulate the formation of this unwanted bony bridge post growth plate injury. Therefore, I am using biomaterials to deliver factors that can suppress blood vessel arrangement at the injury site to hopefully prevent bony bridge formation so that the growth plate can continue to aid in its normal function of bone growth. I got involved with my research because I wanted to make a difference in the field of science. I believe each semester of work gets me one step closer to helping children with growth plate injuries. I see the significance of my project and realize that there needs to be more research done in my area of interest due to the great need of finding a treatment for children with growth plate injuries. Knowing that I will contribute to the field by pursuing this research makes it meaningful to me and is why I continue to participate in it. Do not get frustrated if you cannot find a research opportunity immediately. It may take time and multiple attempts in order to find something that you are interested in. It is okay to try out a research interest and then change your mind. Do not settle for research you do not truly enjoy, there is something out there for everyone! I enjoy being able to work in a professional environment such as UConn Health. It has allowed me to meet and connect with faculty and explore different types of research and opportunities available. I feel prepared for the professional environment in the future because of my experience at UConn Health with the Health Research Program. I plan on attending dental school after graduation. My project has definitely helped me find my research interests such as histology. I would love to continue to do research involving histology while in graduate school. The lab skills I learned have prepared me for the hands-on work I will be doing in dental school and has improved my dexterity significantly. Having my lab in the UConn School of Dental Medicine has been amazing for me as I have been able to connect with the oral surgeon working on my project and was able to develop a strong relationship with her and even shadow her. Learning about dental research with other faculty has also expanded my knowledge on basic science and clinical research opportunities available in the future. My research and relationships made with other experts in the field have confirmed my desire to go to dental school. Meet Brendan Hogan ’21 (CLAS), an OUR Peer Research Ambassador (PRA) majoring in Political Science and Psychology. As of right now, I have participated in research that revolves around the influence of intellectual humility upon public discourse. Essentially, when someone engages in a conversation with another person over a political issue in today’s political climate, the conversation tends to go into one of two directions. When a conversation begins, it can either end with both parties either agreeing or both parties disagreeing. When both parties disagree over a topic, a hostile conversation usually is created where both sides become angry and attempt to force their opinion on the other. Thus, the researchers I have worked with have been trying to create a third outcome where parties can instead agree to disagree. With this, both sides are able to acknowledge the facts of the other side and ultimately end the conversation with a humble realization that we are all trying together to find a solution. Thus, it creates this idea that we are all attempting to solve the issues of today and should work together as a society to compromise. In the future, I hopefully will be able to carry out a research project where I can intertwine my love for photography with political science and human rights. I may look towards the area of political journalism to find a more solidified direction for my project. When I was provided this opportunity to carry out research, I saw it as a chance to become exposed to a real life research project. From the opportunity, I hoped that I would be able to take what I learned and then carry out my own project. While the research experiment is an important aspect of the project, it was also pertinent that I became accustomed to the behind-the-scenes management and organization of a project. In addition, I took the research opportunity as I felt a desire to understand this area of political science and attempt to figure out how researchers are trying to solve the political polarization of today. Without this desire to take part in this specific research project, I would not have gotten involved as the work that I conducted and research that I carried out would not have been enjoyable. When you are jumping into college, it is easy to sign up for and commit to many extracurricular activities. If I could give you any advice, it would be to try to find a few things that you love the most and stay committed to those activities throughout your undergraduate years. Work to improve those clubs, positions, and opportunities, but also look to find a balance between your own personal life and college career. The next few years will be some of the most enjoyable years of your life, so don’t forget to take the time to not only build your resume, but to grow as an individual and find yourself. If you can do this, you will be able to graduate with an idea of what is important to you and what you want to do after your time at UConn. After I finished my research, I found that I have begun to approach arguments from the perspectives of both sides. This concept of intellectual humility has really shed light on the issue of political polarization for me and has shown me that it is important to work towards compromises. With this real world application of research, this experience has left a lasting impact on my outlook in my everyday interactions with others. After I graduate, I hope to go to law school and eventually practice law in Connecticut or New York. From this research, it has inspired me to take on a neutral stance in debates and conversations so that the facts of the argument can first be examined. From there, it has shown to me that no one side is necessarily right, but rather both sides should meet in the middle and overcome this political divide. Without people attempting to reach a middle ground, our polarized political climate will only worsen in the future. Thus, as this research was applicable to my area of study, I have found that it has allowed me to grow as a political scientist, a potential lawyer, and as an individual. 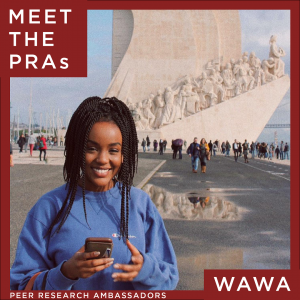 Meet Wanjiku (Wawa) Gatheru ’20 (CAHNR), an OUR Peer Research Ambassador (PRA) majoring in Environmental Studies. During the summer after my freshman year, I was lucky enough to join the Community Nutrition lab of Dr. Amy Mobley – an experience that lasted for a year and a half. It was through that experience that my passion for food access issues emerged and my eventual IDEA grant project was born: the UConn Access to Food Effort – an initiative to quantify food insecurity at UConn and to create a locally sourced food pantry on campus. I initially got involved in research through the Bridging the Gap program the summer of 2017. It was this experience that allowed me to work as a research assistant in Community Nutrition lab of Dr. Amy Mobley. UConn is a hub of opportunity – take advantage of it! As a freshman, you have a fresh slate and more time to explore than any other year. Take this time to discover your passions and dislikes. Take risks, be open, and put yourself out there! And most of all – do not get caught up in following a pre-determined plan. Unplanned opportunities will be some of the most important ones you will get involved with. Take a chance with the unexpected – you might be pleasantly surprised. My greatest accomplishment has been making a conscious decision to dedicate myself to public service. As a future public servant, my involvement in undergraduate research and creative endeavors has allowed me to focus my time at UConn on advocacy and awareness. After graduation, I plan to join the Peace Corps as a Coastal Resource Management Community Outreach Facilitator or pursue another service-oriented international experience. My service-learning IDEA grant has made it more evident to me that public service is the path for me. Meet Divya Ganugapati ’19 (CLAS), an OUR Peer Research Ambassador (PRA) majoring in Cognitive Science. My current research project investigates what aspects of language and phonetic properties of speech contribute to voice identification. I got involved in research because I had a curiosity to learn more about the brain. My courses offered me a strong foundation in understanding neural mechanisms, but I had many questions that were unanswered, thus pointing to research as the mechanism to discover answers. As a freshman, you face a wide array of opportunities – socially and academically – don’t be afraid to take the time to explore and discover your passions. Being adaptable is the best way to find the major, research, internship, etc. that is best for you. My favorite part of research is that I create the questions. Unlike in classes, where the curriculum is predetermined in a syllabus, in research I design an entire experiment to follow my own interests. The feeling of intellectual freedom and creativity is something I had not experienced until conducting research. Doing research in the Speech, Language, and Hearing Sciences Department actually altered my career interests by swaying me towards medicine. Analyzing fMRI scans, interacting with aphasia patients, and reading literature connecting speech to neurological disorders sparked an interest in neurology and cognitive/communicative disorders. 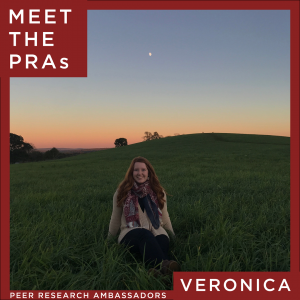 Meet Veronica Pleasant ’19 (CAHNR), an OUR Peer Research Ambassador (PRA) majoring in Animal Science and Pathobiology. I’ve been involved with Dr. Kristen Govoni’s laboratory for the last three years, and our focuses have varied from sheep to neonatal calves, all under the umbrella of maternal programming, or the idea that alterations to the intrauterine environment can impact offspring growth and development. Currently, we are working on the impact of maternal nutrition on the offspring in conjunction with North Dakota State University. As a member of Women in Math, Science and Engineering (WiMSE) Learning Community, we were introduced to the idea of getting involved in undergraduate research as part of the FYE class. Although incredibly intimidating, I got the idea that I would really like to try it out, to see if I liked it. Luckily, Dr. Govoni is the faculty director of WiMSE, and I asked her if she had space in her lab, and she did! Here we are three years later, still going strong! Faculty are people too. I think a lot of first year students become intimidated by their professors because they are so knowledgeable, and more experienced. However, having that in-person connection makes all the difference. Faculty members often love to talk about their research, so please don’t hesitate to ask them about it! Presenting in Vancouver, Canada, was definitely my greatest research accomplishment. It was absolutely terrifying to be representing UConn on an international stage, and in such a scientific capacity with people who have had careers in the animal science field longer than I’ve been alive. However, it went swimmingly, and I am better for the experience! My plans after graduation including going to veterinary school for my DVM, and then, or concurrently, my PhD in some facet of infectious disease research. I never, ever, in my wildest dreams imagined that I would be interested in putting myself through school for an additional 7-8 years, but research led me here. Working in the lab has built my confidence, my laboratory skills, and my time management skills in a way no other experience could have. It piqued my interest in doing research for any part of my career, and now I’m actively pursuing my new goals. Meet Ariane Garrett ’20 (ENG, CLAS), an OUR Peer Research Ambassador (PRA) majoring in Biomedical Engineering and Spanish. I work in the Hoshino Laboratories developing a novel cerebral spinal fluid shunt capable of detecting flow. Cerebral spinal fluid shunts are the primary form of treatment for hydrocephalus, a disease that causes a buildup of cerebral spinal fluid (CSF) in the brain. Shunts are intended to be lifelong implants but are very prone to failure. In addition, the symptoms of shunt failure are often ambiguous, making it difficult to diagnose. Our device aims to solve this problem by creating a simple, cost effective, and non-invasive way of determining CSF flow through the shunt. I initially got involved in research because I was curious about the research process and I wanted to learn more about biomedical engineering. I stayed involved with research because I really enjoy the design process, and it is extremely rewarding to see your ideas come to life. At this point, I’ve been working on my project for over a year now. Throughout this time, I’ve grown as a researcher and learned many useful skills that I wouldn’t have in the classroom. When you first join a lab, it may seem very boring or overwhelming. Try to stick with it for a little while and be patient. Most likely, it will take time for you to be given real responsibility and interesting tasks. In the meantime, learn as much as you can by observing those around you and reading relevant literature. As an engineer, my favorite part of research is the design process. You start with a conceptual goal and a few parameters that must be met, and it’s your job as the researcher to turn that concept into reality. I always start by brainstorming and sketching in my lab notebook. Then, after I’ve fleshed out my idea a bit more, I design it in Solidworks. At this point I seek feedback from other people in the lab, who often point out some problems I missed the first time. Then, I make a procedure for turning the design into reality. Sometimes, that just involves sending the design to Shapeways, other times it requires designing and milling molds. Finally, the design is made. It’s pretty cool to hold a part you designed in your hands, knowing every little detail that went into its creation. My greatest research accomplishment so far was presenting at the Holster Scholar symposium early in my sophomore year. After spending the whole summer working on my project and struggling to find my place in the lab, it was rewarding to stand up in front of my peers and talk about my accomplishments. Even though that time didn’t mark the height of my research achievements, it signified the end of my first summer doing research full time, living in an apartment, and working independently. I proved to myself that I was capable of seeing my project through to the end, and it felt great!